Alex Shy was raised in Woodbridge, VA where his affinity for the outdoors and technology began. He graduated from West Virginia University (WVU) with a Bachelor's of Science degree in Forest Resource Management with a focus on Remote Sensing. While at WVU, he worked for the university as a GIS specialist and began building, operating, and studying drone technology. Since graduating from WVU, he went on to become an Urban Forester Technician for the 6-time gold medal awarded Montgomery County Department of Parks, where he is the arboricultural department's ISA certified arborist, GIS Specialist, and Drone Pilot. 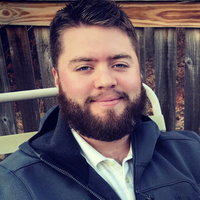 Alex recently joined Atlantic UAV to head the Maryland Division as Sales Executive, Pilot, and GIS Specialist. When Alex is not working he enjoys camping, fishing, and all things outdoors with his wife, daughter, and two dogs. He also plays guitar, adult league softball, and is an amateur craft beer homebrewer.